Flying the Able Dog successfully meant being alert for the unexpected and anticipating problems. The aircraft was unforgiving of mistakes, but like TNT, was reliable and safe when handled with confidence and within your capabilities. Carrier operations were the ultimate test of aircraft and pilot. 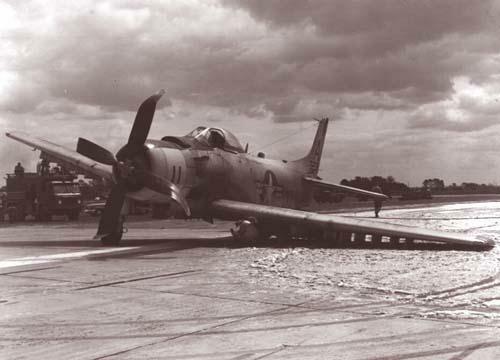 My only accident in the Skyraider was during Field Carrier Landing Practice [FCLP] in preparation for VMA-211 going aboard the USS Roosevelt. On April 18, 1957, I was number three in a four-plane FCLP pattern in the morning at NAAS Edenton, NC. "Horse" Lowery was paddles and was having fun working us safely to the cut. I was past the ninety when Horse came into view. His legs were spread wide and the paddles extended straight out on each side and level. The hot pink reflective silk adorning his suit and paddles clearly fluttered in the breeze. His arms rocked from level to nearly vertical as he urged me to tighten my turn. I increased bank and the paddles went back to the roger position. If I don’t get Right Rudder! When I again arrived at the 45, the LSO was rapidly criss-crossing his paddles over his head signaling to wave-off. Horse called, "Able Fox aircraft, your signal is Dog!" I raised the gear handle and commenced climbing to the Dog Pattern. Horse called again, "Not you Able Fox Eleven! Keep it coming for a low pass!" I put the gear handle back down and went by at 20 feet. Horse spoke, "Your left main landing gear is cocked nearly 90 degrees to the left. Climb and burn down. We’ll put you into the Morest as soon as it’s rigged." After two hours of orbiting at 2000 feet over the base, Horse called me for "hook down" and then "Charlie" on the main runway for trap into the experimental Morest gear. Crash trucks had foamed the Morest cable run out area. The entire base population appeared to be gathered on both sides of the approach end of the runway, eating lunch, laughing and scratching, eagerly anticipating the inevitable accident. Perhaps most of the wives, with toddlers, plus a couple of dozen dogs were there too. Horse talked me around the pattern as we flew a standard FCLP approach. 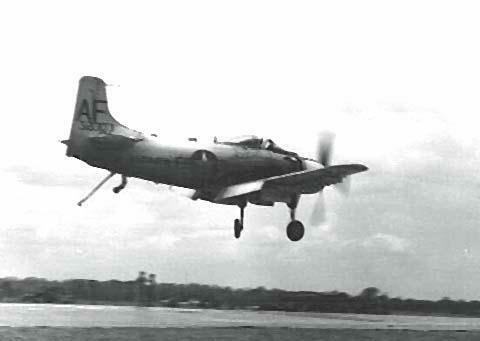 I rolled the Skyraider wings level on a short final for arrestment with the reflecting LSO paddles horizontal and steady. Horse finally slapped the right paddle across his chest. I was sure he had cut me late! I did a quick pump nose over and then flared the hook into the wire. That was exactly what Horse planned. He didn’t want an early cut that could wipe out the left gear and maybe snag and cut the arresting wire. I turned off the magneto switch just as the hook grabbed the cable. For a second or two, the Able Dog stayed level. Then the left gear collapsed. The noon horn blasted simultaneously with the crash trucks sirens as metal screamed against concrete and the nearly 15 foot prop pounded the cement. I cut the mixture and gas, opened the lap belt and dove over the port side. It was a short drop to the deck. Slipping and Sliding, I ran through the foam to the side of the runway. I hated having that Charlie damage accident in my logbook. I had much hairier flights in the Able Dog.